Barbara Strawson, a USDF Gold, Silver and Bronze Medalist, has trained and competed horses from USDF Training Level through FEI Grand Prix. Barbara brings over 30 years of experience to her business, Barbara Strawson LLC, which she began in 2005. From 2001 to the end of 2004, Barbara trained in Germany with Nicole Uphoff, 4-time Olympic Gold Medalist. 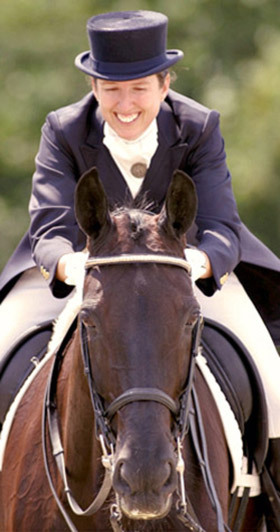 While in Germany, Barbara trained and competed through Grand Prix while riding as Nicole’s assistant. Previously, Barbara began her FEI career training with Scott Hassler, USEF National Young Horse Dressage Coach and was the Assistant trainer at Hilltop Farm in Colora, MD from 1990 to 2003. Not only an experienced instructor and trainer, Barbara has authored several magazine articles, co-authored the book, My Riding Goals Journal, and contributed to Equestrian Instruction. Both books are dedicated to improving personal performance in riding and instruction methods. Further, Barbara is a Balimo™ Graduate Core Instructor and has begun the Mary Wanless teacher training courses. Barbara's skills and sensitivity allow her to bring out the potential in a variety of horse types and personalities. In addition, her philosophy -that each client is an individual with a unique learning style - results in her ability to help each horse and client to connect to the power of their own potential. Along the way in her career, Barbara received a lot of help, support, and inspiration from others. One of Barbara's goals is to return this generosity by finding ways to encourage and support others along the same path in addition to sharing the beauty of horses as a benefit to worthy causes. See a summary of Barbara's support of local community events. Barbara has been blessed with horses in her life from the time she was three years old. "Horse people" know what an honor it is to have horses in your life. Horses are a source of friendship, inspiration, knowledge and growth. Having such a partnership with horses can be a most rewarding experience. Co-authored "My Riding Goals Journal"
Dressage Today, photograph of Barbara in the article, "Learn About the 2007 Test Changes".